In the developed world, the annual incidence of cerebral palsy (CP) is approximately 3–4 per 1000 live births. The annual incidence in the USA is estimated to be between 8000 and 16,000 new cases of CP per year. The overall society prevalence is increasing due to increased survival of premature infants and increase survivorship into adulthood (Sellier 2018). The exact number of patients with CP in the USA is unknown. However, it is estimated to be between 700,000 and one million. As our society grows with more adults with CP, unique new problems need to be addressed within the framework of our healthcare system. The concept of “premature aging” is an important issue for these patients. The majority of adults with cerebral palsy note chronic pain, and 25% of adults in their 1920s already have the early signs of arthritis and degenerative joint disease. Figure 1 shows a typical adult population of patients with CP (Sellier 2018). 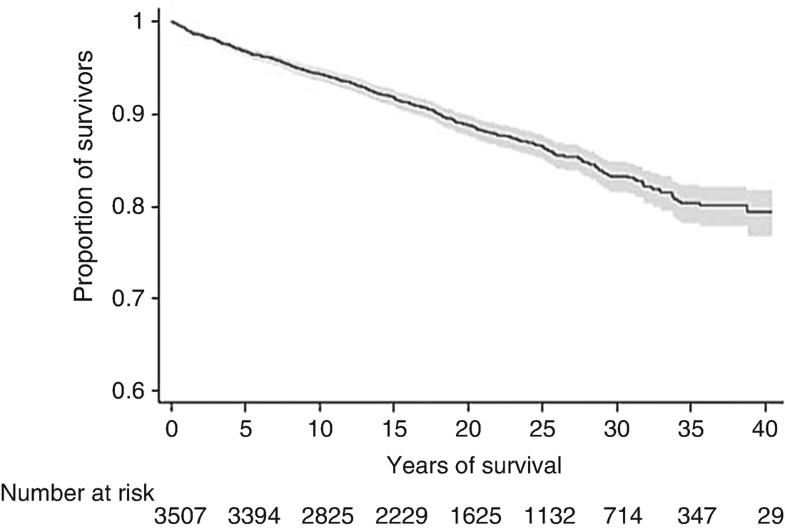 The graph clearly shows that survivorship of up to 80% can be expected out to age 40. The primary impairments of cerebral palsy include abnormal muscle tone, loss of selected muscle control, impaired coordination and balance, weakness, and loss of sensation. The consequence of these primary problems combined with the effects of growth, time, and developmental delays lead to progressive orthopedic issues including dynamic muscle contractures, joint contractures, instability, arthritis, and bony deformity (Murphy 2010; Horstmann et al. 2009). It’s unclear about the effects of a longer time on any of these secondary impairments. Certainly the lack of normal activities of daily living may lead to progressive contractures. Increased tone, contractures, and increased body mass index may lead to increased loads across joints with subsequent arthritis and pain. 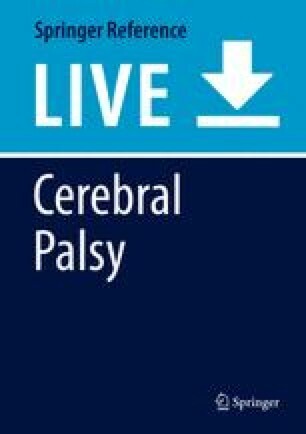 There is very little in the medical literature regarding the outcomes of adults with cerebral palsy. It is uncertain what surgical procedures may be needed. It is also unclear on who should perform the procedures and whether they should be done in pediatric or adult hospitals. Most adults with CP will have some subtle changes in their gait with decreased endurance. There is the concept of muscle wasting and sarcopenia of aging. In nonambulatory patients, poor soft tissue coverage can lead to skin ulcers and pressure injuries. It is important for clinicians to understand that aging complaints maybe disability specific. But it is equally important to not ignore the typical problems of aging such as hypertension, hypercholesterolemia, and physical inactivity. Up to 80% of adults will complain of chronic pain (Murphy 2010). Pain management solutions can be difficult to achieve in the setting of adulthood and CP. In addition to normal adult pain management, the management of spasticity including botulinum toxins and oral medications such as baclofen and benzodiazepenes can be crucial in helping control pain in adults with CP. Physical modalities such as massage, chiropractic care, or wheelchair modifications with frequently changing positions are also very important. Adults with cerebral palsy may have a variety of issues with their spine (Murphy 2009). Scoliosis is the most common spinal disorder that affects adolescents with CP. These neuromuscular curves give me progressive with significant issues affecting seating and negatively affecting quality of life. Often times, pelvic obliquity is associated with cerebral palsy and scoliosis. Unlike idiopathic scoliosis, a very high percentage of CP curves attend progress over time it’s makes this a very relevant issue for our adult patient population. Scoliosis in CP is more common in patients with GMFCS IV and V level function. The initial treatment is postural management with seating modifications of the wheelchair and possible bracing. Once the curve is greater than 50°, most spine deformities will tend to progress rapidly and spine fusion should be considered (Fig. 2). Posterior spinal fusion should consist of a long fusion from the upper thoracic spine down to the lower lumbar spine often and usually includes fusion to the pelvis (Fig. 3). This surgical procedure is often done in young adulthood. This may occur in individuals who were recommended to have surgery during adolescence, but their families were initially hesitant to proceed with the surgical procedure. Literature shows that after spinal fusion families of patients with cerebral palsy report increased quality-of-life scores. Approximately 90% of parents and caretakers recommend the surgery and report satisfaction. Disease-specific instruments such as the CPCHILD quality-of-life instrument have been shown to increase after spine fusion (Miyanji et al. 2018). Spine fusion with cerebral palsy can have a relatively high complication rate. Infection rates in been reported between 1% and 15% (Lonstein et al. 2012). Perioperative mortality has been reported to be as high as 1%. An international study group for spine deformity has reported a complication rate of 46% but show the complications were not “correlated with quality-of-life scores.” They demonstrated that those scores increased personal care, positioning, and comfort domains over 5 years. The conclusion of this study was that the benefits of surgery in this patient population certainly outweigh the risk of complications (Miyanji et al. 2018). Adults with cerebral palsy can also have cervical stenosis. There is an approximately an eight times increased risk of cervical stenosis, instability, degenerative disk disease in patients with hyperkinetic cerebral palsy (Fig. 4) (Fuji et al. 1987). This can lead to radicular pain myelopathy and progressive neurological deficits. Healthcare provider should be wary of any patient complaining of loss of function. Anecdotally, this is been blamed on the patients with “cerebral palsy.” In reality, the neurological lesion in CP is not progressive at all and any loss of function should be a clue to look for cervical instability. Treatment of any type of cervical dystonia includes medical management of dystonia. Initial treatment also includes seating and positional modifications. Severe dystonia and hyperkinetic movements maybe treated by cervical intrathecal baclofen pump placement or by deep brain stimulation. 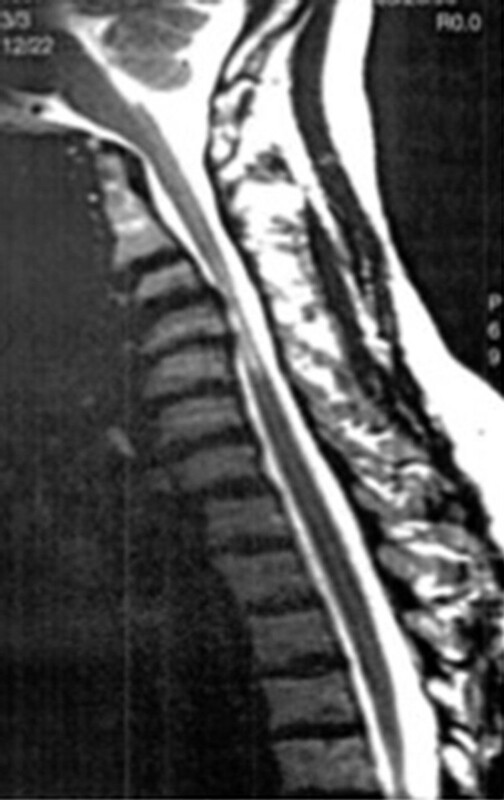 Surgical decompression of the cervical spine may be indicated for rapidly progressive neurological deficits, failure of conservative treatment, or progressive functional loss. Lumbar spinal stenosis can also occur at higher levels in patients in CP (Fig. 5). Spondylolisthesis is another spine disorder that is higher in the cerebral palsy population than in those typically developed adults. The risk of a spondylosis is up to 20% of patients with GMFCS I–III functional levels (Hennrikus et al. 1993). That is compared to only 5–6% of the general population. The risk of a slip is theoretically higher after selective dorsal rhizotomy (Harada et al. 1993). Low-grade slips should be responsive to conservative therapy including physical therapy and activity modification. 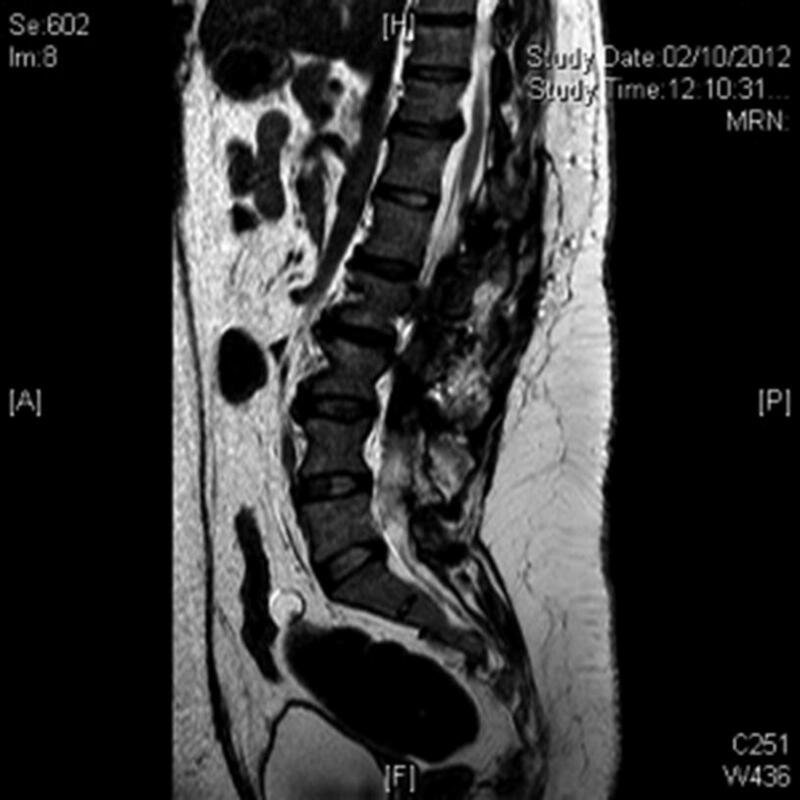 Progression to high-grade spondylolisthesis may require an L4 to S1 posterior spinal fusion. The biggest issue with children and adolescents with cerebral palsy in their hips is neuromuscular hip dysplasia. The incidence of dysplasia in patients is extremely common up to 70–90% in patients with GMFCS IV and V functional level. Treatment is recommended with either preventive surgery or hip reconstruction when the migration percentage reaches a critical value of 40% or more. The surgical procedure is often a varus derotational osteotomy with soft tissue release and plus or minus pelvic osteotomy. This has quite a high success rate in the literature and outcomes have been shown to be better with children of advanced age, lower migration percentages at the time of the hip surgery, and surgeon experience. Untreated hip dysplasia in patients with cerebral palsy can lead to frank dislocation over time abnormal forces acting on the femoral head occur from contact and rubbing of the pelvis and muscles wearing across the cartilage surface (Hodgkinson et al. 2001). 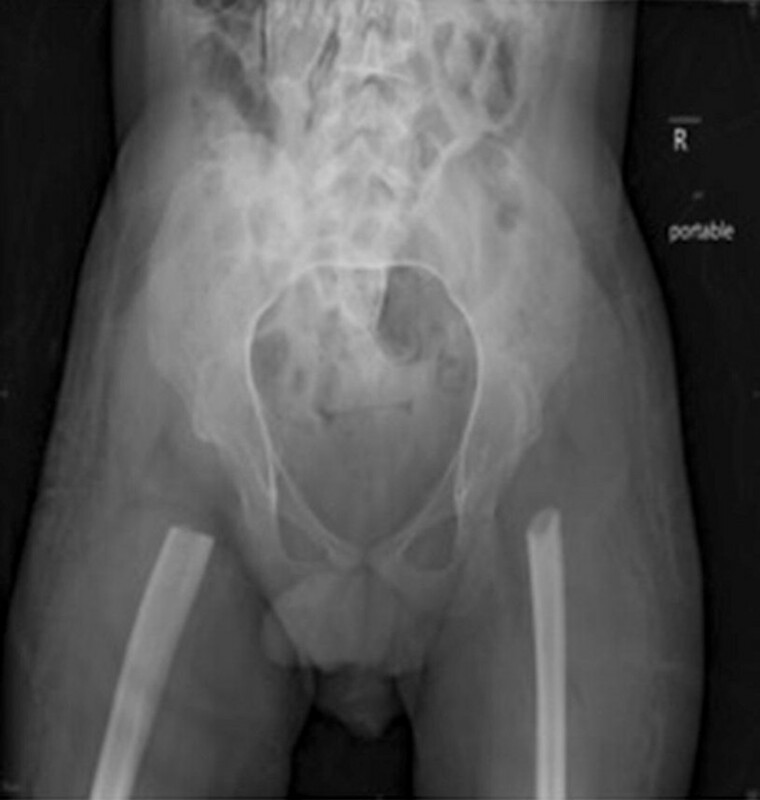 This pathological position of the femoral head leads to degenerative joint disease and pain in a large percentage of patients, and most centers with a large experience of treating patients with cerebral palsy acknowledged that the dislocated hip is likely to be more painful than a reduced hip (Ramstad et al. 2017). Knowing that salvage procedures are much less predictive than reconstruction, this knowledgeably has led to formalized hip surveillance with most patients being recommended to have more of a preventative strategy. However, once severe hip dysplasia hip arthritis and pain are present, the treatment options are severely limited. This is where this issue becomes very prominent and pertinent in for adult population. Significant painful hip dysplasia in adults with cerebral palsy typically would be treated with salvage surgery. One of the most common types of hip salvage surgery would be a proximal femoral resection or a capsule interpositional arthroplasty (Castle and Schneider 1978). In this case, the entire proximal femur is resected below the level of the lesser trochanter and the musculature around the hip is interposed to provide pain relief (Fig. 6). Another common technique is the McHale salvage procedure where the femoral neck is resected and the proximal femur is placed into a valgus position with an osteotomy (McHale et al. 1990; McCarthy et al. 1988). Salvage surgeries in general are not as successful as reconstruction and carry a high complication rate. Most complications include continual pain proximal migration and bony prominences and heterotopic ossification (Patel et al. 2015; Kolman et al. 2015). Total hip arthroplasty can be performed in select individuals; however, there are significant risks of complications in the cerebral palsy population. Osteopenia and poor bone stock can lead to loosening and peri-prosthetic fractures, medical issues placed these patients at high risk for infection. Also muscle imbalance leads to a high rate of dislocation. However, there are some moderate series which show the results of total hip arthroplasty especially in some community ambulator to be quite promising (Schroeder et al. 2010; Raphael et al. 2010; Houdek 2017). Most problems related to the knee an adult with cerebral palsy result from significant knee flexure issues including the flexor contractions and lack of knee extension strength. The most common clinical scenario that we see in adults with cerebral palsy is a crouched gait. This can result from the above-stated imbalance or can result from over lengthening heel cords in childhood. Progressive crouched gait places the individual at a significant make mechanical disadvantage and walking with significant increases in energy expenditure. Progression of the crouched position can lead to significant anterior knee pain and patellofemoral arthritis. Progression of this overall clinical complex can lead some individuals to lose their walking ability (Fig. 7). As a general rule, in the lower extremity in adults with cerebral palsy, soft tissue lengthening alone is not likely to provide meaningful functional improvements. Accordingly, a hamstring lengthening alone is unlikely going to improve a significant knee flexion contracture at an adult with CP. For those patients who have lost a significant functional ambulation potential, a distal femoral extension osteotomy with patellar tendon shortening is the treatment of choice. 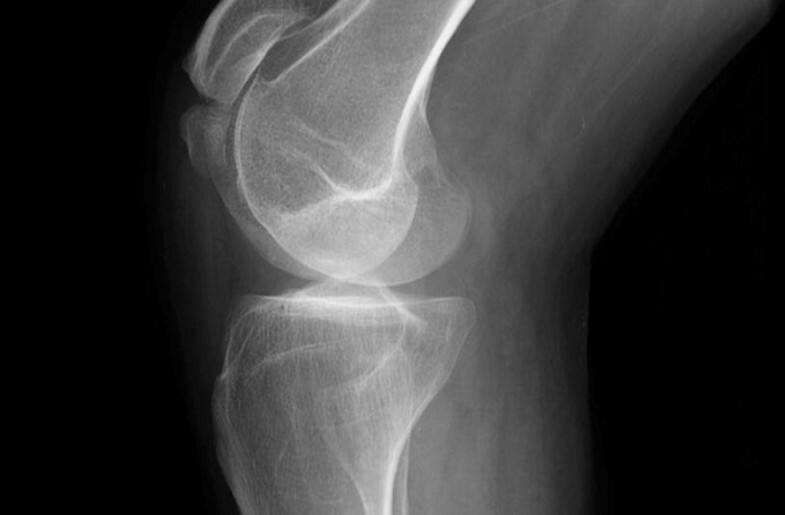 Care should be noted to evaluate the patellofemoral joint for severe degenerative arthritis. Significant patellar cartilage loss is a negative indicator for progressive ambulation in the future. Patellofemoral arthroplasty can be considered in select cases. Also, these patients may have tricompartmental arthroplasty along with the typically developed general population, and total knee arthroplasty again may be utilized in select populations (Houdek 2017a, b). Stiff knee gait is another common knee pathology that we see in adolescence with cerebral palsy and in adults. This typically results from rectus femoris spasticity and limits the amount of knee flexion that we can get in swing phase and the leg is the peak knee flexion to later in the gait cycle. The patient presents with isolated knee stiffness that is limiting their ability to clear the foot in swing phase may benefit from a rectus femoris resection. Patellar instability problems can also occur in the adult with cerebral palsy. Traditional, sports type patellar realignment surgery such as lateral releases and mid-medial patellofemoral ligament reconstructions are not likely to be effective in the setting of cerebral palsy. These procedures may need to be augmented with a tibial tubercle osteotomy a more significant lateral release more significant medial reconstructions including vastus medialis plications and possible Galeazzi type reconstructions with tendon was woven through the patella. Limb malalignment can occur in the adult with cerebral palsy. This is typically from adolescence to his malalignment in both femoral rotation and/or tibial rotation was not addressed as an adolescent. In adults with closed growth plates, rotational procedures can be performed more percutaneously with intramedullary nail fixation. This can help facilitate the rehabilitation process that otherwise is quite significant in adults with CP. The rotational abnormalities can result in the classic lever arm dysfunction with external tibial torsion, increased femoral anteversion, and pes planovalgus feet; this also needs to be recognized in a patient who presents with gait as the lever arm malrotations affect the knee extension plantar flexion couple and can be a causative factor for at least a portion of the patient’s increased knee flexion (Putz 2016a, b). Probably the most common surgical procedures performed by orthopedic surgeons in adults with CP revolve around foot and ankle issues. These can be issues that were never addressed during childhood and adolescence, or they can be consequences of some of the negative aspects of poorly designed treatment. The best example is a calcaneus gait and foot deformity as a result of overlengthened heel cords. 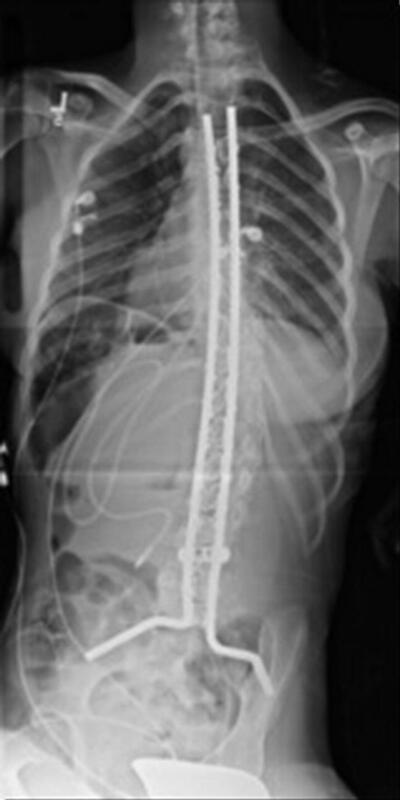 This can cause significant functional disability for the patient, and there is not an adequate surgical solution for this ill-advised procedure in childhood. The most effective assistance that a provider can give the patient in the situation is an excellent fitting orthosis. Repeat Achilles tendon or plantar flexion lengthening in the form of gastrocnemius recessions are probably the most commonly needed foot and ankle procedure in adults with CP. This procedure alone is quite well tolerated and usually allows the patient to significantly improve their gait and requires a rehabilitation that is usually quite well tolerated. Patients will present with both varus and valgus foot deformities. For the varus foot, an anterior or posterior tibial tendon transfer can improve a flexible deformity. But as we mentioned previously, a soft tissue procedure like this is unlikely to provide complete resolution of the deformity. Bony reconstruction is likely necessary for most feet issues and adults with CP, and for the varus foot, that would include usually a calcaneal osteotomy and possibly a midfoot osteotomy as well. Pes planovalgus foot deformities and shoulder with cerebral palsy are often treated with calcaneal osteotomies and lateral column lengthenings. This alone would be unlikely to be effective in most adults that come and present with significant symptomatic pes planovalgus foot deformities. More likely, a calcaneocuboid lengthening fusion through the joint would be required as well as a medial bony procedure with either a plantar-based closing osteotomy of the midfoot and medial cuneiforms or talonavicular fusion. Significant deformities should be treated with either subtalar arthrodesis or triple arthrodesis (Trehan et al. 2015). The treating physician should not be hesitant to consider hindfoot fusion in the setting of adults with cerebral palsy. Less definitive procedures are unlikely to make a significant difference for this patient population, and the rehabilitation is so significant that the best procedure that can be offered to most of these patients would be a definitive one with a low risk of recurrence. First ray deformities are also common in cerebral palsy, and these typically include either a dorsal bunion or medial bunion. The dorsal bunon occurs primarily in nonambulatory patients but hallux valgus occurs in both ambulatory and nonambulatory patients. The most appropriate treatment for both of these foot deformities would be a first metatarsophalangeal (MTP) arthrodesis which is well tolerated by adults with cerebral palsy and greatly appreciated with a significantly high patient satisfaction rate. The concept of doing multiple surgical procedures and a single surgical setting is encompassed by the term single stage multilevel surgery or SEMLS. The idea is that all muscle lengthenings transfers and correction of all bony deformities would occur in a single surgical session. The major advantage of this is a single rehabilitative session where the patient can truly concentrate on the rehabilitation and have minimal other distractions in their schedule at this critical time of their lives (Putz 2016; Gannotti et al. 2010). It has been shown to have high patient satisfaction and possibly improve function with the subsequent goals of having minimal mobilization with the hopefully decrease risk of recurrence of deformities. The timing of any orthopedic surgery for an adult can be more problematic to coordinate because of differences in the calendar of life. Most adults are no longer students, many have jobs and careers, and family obligations make a dedicated time to concentrate on rehabilitation more difficult to obtain and schedule. However, adults also typically have somewhat decreased endurance in general for aerobic type exercise compared to adolescence, and even more simple surgical procedures may take a significant amount of time to recover and rehabilitate. Therefore, a social needs assessment and very intentional and deliberate scheduling with a family-centered care approach is crucial for the success of any orthopedic surgery and adults with CP. The question comes up of who is the best surgeon to care for these adults with CP. Certainly an adult orthopedic surgeon who has some expertise in cerebral palsy is beneficial. However, subsequent subspecialty training of adult orthopedic specialties makes this type of surgeon a rare commodity. In general, most of the surgical procedures that we have discussed in this chapter are not so technically demanding that adult specialist are not familiar with the techniques and are quite proficient in them. The typical missing piece for adult providers is the clinical judgment that comes with proper patient selection in the setting of cerebral palsy and overall comfort for dealing with adults with disabilities. Hip salvage surgery procedures are really in the expertise of pediatric orthopedic surgeons and although adult hip surgeons do occasionally perform these, ideally the best scenario would be with a combined approach for pediatric and adult specialist together. For young adults with spine surgery, the pediatric orthopedic surgeon often is called to treat them in his probably appropriate up until the middle portion of adulthood. However, adult spine deformity surgery can involve some specialized techniques including transforaminal type decompression, anterior procedures, and more decompression type surgery where adult spine surgeons may be preferred for their technical expertise. Joint replacement can typically be performed by arthroplasty surgeons and in fact this is an area where they would have considerably more expertise in the technical details of the surgery, when compared to pediatric surgeons. Although in this particular procedure, the overall clinical judgment and expertise in dealing with cerebral palsy may be lacking in the typical adult reconstruction practice. Foot and ankle surgery is probably the area that translates most easily to adult and that most of the procedures that would be required for an adult with cerebral palsy are typical procedures that are performed in the adult foot and ankle practice. The hospital location for where these procedures should take place is also a complex issue. Most pediatric hospitals are very comfortable taking care of older adolescents and young adults with childhood onset disabilities, especially those that may have intellectual disabilities, and therefore, it would make sense to have pediatric facilities that could be open to treating some adults. However, this can become more problematic with older adults who have more adult type medical issues such as hypertension, diabetes, and coronary artery disease. The medical subspecialty assistance in the form of internal medicine and intensive care specialist may not be comfortable taking care of older adults. The operating room also has issues and that they may not regularly stock certain instruments that might be needed especially in spine and arthroplasty surgery. Furthermore, the OR personnel may not be accustomed to those procedures, not withstanding the surgeons experience. Conversely, many adult hospitals are not sessile with treating adults with disabilities, especially those with childhood onset disability like cerebral palsy. However, with the longevity of these patients with neurodevelopmental disabilities increasing and more children living into adulthood, the burden on adult facilities will only increase. The perioperative management of adults with cerebral palsy also may vary quite a bit from what is typically done in the pediatric hospital setting. In particular, consideration of the ASA class in regards to cardiac risk may be important for certain patients. And anticoagulation will need to be considered for any lower extremity surgery in adults with cerebral palsy. That is typically not needed in pediatric orthopedic surgery in the setting of CP as the literature demonstrates that the risk of thromboembolism is quite low in these patients. However, in adults with CP, they are much more risk for deep venous thrombosis and pulmonary embolism and prophylaxis has to be considered at some level. The ideal setting for orthopedic surgical care for adults with cerebral palsy would be in the setting of a adult facility with a medical home model with both primary care physicians and subspecialist such as physical medicine and rehabilitation and/or orthopedic surgeons who are all familiar with and comfortable with treating adults with pediatric onset disabilities. Subspecialty consultation including consultation for particular surgical procedures could then be carried out on a case-by-case basis. In conclusion, patients with cerebral palsy may require additional orthopedic care into their adult lives. Appropriate knowledge of the pathophysiology of cerebral palsy and the trajectory of this musculoskeletal disability into adulthood is vital for healthcare providers to provide appropriate care for this patient population. Transition models that include an appropriate medical home along with subspecialty providers that have interest and expertise in CP can provide appropriate musculoskeletal care into adulthood for patients with cerebral palsy.